In some cases, you need to regularly create a full backup. For example, your corporate backup policy may require that you create a full backup on weekend and run incremental backup on work days. To let you conform to these requirements, Veeam Backup & Replication lets you create active full backups. The active full backup produces a full backup of a VM, just as if you run the backup job for the first time. Veeam Backup & Replication retrieves data for the whole VM from the source, compresses and deduplicates it and stores it to the full backup file — VBK. The active full backup resets a backup chain. All incremental backup files use the latest active full backup file as a new starting point. A previously used full backup file remains on disk until it is automatically deleted according to the retention policy. You can create active full backups manually or schedule a backup job to create active full backups periodically. To create an active full backup manually, use the Active Full command from the shortcut menu of a corresponding backup job. 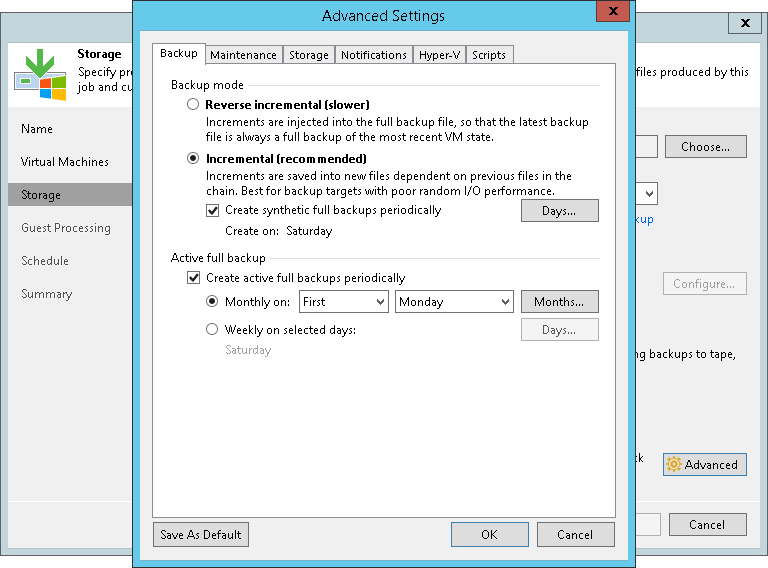 To schedule active full backups, specify scheduling settings in the Advanced section of a corresponding backup job. You can schedule active full backups to run weekly, for example, every Saturday, or monthly, for example, every fourth Sunday of a month. Veeam Backup & Replication automatically triggers a backup job to create an active full backup, even if a regular backup job session is not scheduled on this day. The job session is started at the same time when the parent backup job is scheduled. For example, if you schedule the parent backup job at 12:00 AM Sunday through Friday, and schedule active full backup on Saturday, Veeam Backup & Replication will start a backup job session that will produce an active full backup at 12:00 AM on Saturday. If the parent backup job is not scheduled to run automatically or disabled, Veeam Backup & Replication will not perform active full backup. If a regular backup job is scheduled together with active full backup, Veeam Backup & Replication will produce only one backup file — an active full backup that will contain the latest state of the source VM. An incremental backup file that should have been created by the backup job schedule will not be added to the backup chain. Veeam Backup & Replication creates an active full backup only once a day on which active full backup is scheduled (unless you create a full backup manually). If you run the backup job again on the same day, Veeam Backup & Replication will perform incremental backup in a regular manner.